chemotherapy (also called chemo) is a type of cancer treatment that uses drugs to kill or reduce the size of cancer cells. Treat cancer: chemotherapy can be used to cure cancer,lessen the chance it will return, or stop or slow its growth. Ease cancer symptoms: chemo shrinks tumours and relieves cancer symptoms like pain and pressure. 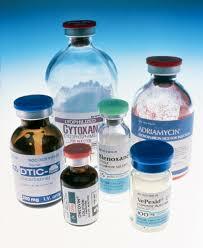 Chemotherapy is used to treat many types of cancer. It may be the only form of treatment or in combination with other cancer treatments. make a tumour smaller before surgery or radiation therapy. This is called neoadjuvant chemo. destroy cancer cells that may remain after treatment with surgery or radiation therapy. this is called adjuvant chemo. The list is endless. Chemotherapy drugs are expensive. For ovarian cancer for example, a single course of chemotherapy drugs in Nigeria cost about N120,000 naira. For a full chemo to shrink ovarian cancer, you need 6 courses. That means it will cost you about N720,000 naira for a full course of chemo for ovarian cancer. The National Health Insurance scheme covers some of this medications. If you are on NHIS, it will reduce your cancer treatment cost burden. Chemo not only kills fast growing cancer cells, but also kills or slows the growth of healthy cells that grow and divide quickly. The common side effects are mouth ulcers, hair loss, vomiting, nausea, anemia, tiredness, skin changes and burns. A full course of chemotherapy for breast cancer treatment in UBTH is about N700,000 naira. In LUTH, a full course chemo for prostate cancer treatment is about N640,000 naira. If you are in need of financial assistance, there are some non-governmental organisations that offer financial support services. The post Chemotherapy: drugs, side effects, cost appeared first on Nigeria Health Blog.